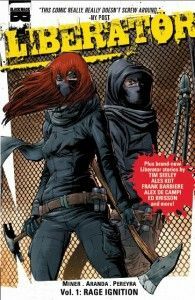 As part of the Liberator trade paperback, Black Mask Studios asked a stellar team of comic creators to play in the world that Matt Miner created. Each team had the chance to create a short story using characters and ideas already explored in the first volume of Liberator, adding to the world and further looking into animal activism and rights. The collected issues combined with all the backups make the Liberator trade a huge collection of comics with a cause. All week long on StashMyComics I’ve been talking with some of the contributors to the Liberator trade, like Ales Kot, Fabian Rangel, Jr., Brian Level, and, of course, Matt Miner himself. Check out all the previous interviews here. In our final interview, we have Megan Hutchison, artist and co-creator on The Aurora Grimeon Stories: Will-O-the-Wisp from Archaia. Megan pulled both writing and art on the short Liberation. Megan Hutchison: Matt Miner and I were both involved in the Occupy Comics anthology and through that found each other on Twitter. There was mutual respect for each other’s craft and we immediately became friends. He asked me to contribute a pinup for Liberator and sent me all the issues to read for research. I loved the series! When he asked me if I would be interested in contributing to the trade I jumped at the opportunity. LJ: You contributed the story Liberation. What’s it all about? 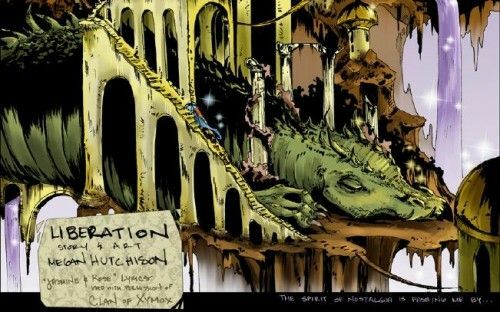 MH: I wanted to do something fun and fantastical in the world of Liberator. It’s a necessarily serious comic, but sometimes you need something lighter to contrast the gravity of a subject matter. I wanted to create something involving the dreams and desires of someone who lives with such compassion and integrity. I also wanted to draw animals in period costumes. MH: I’ve always been a very consciences consumer. I’m a veteran vegetarian, I only buy cruelty-free products, I read and share articles on humane treatment of livestock with my friends and family who eat meat. It’s important to make people aware of the human impact on our ecosystem, we need to be responsible and treat life with respect. MH: Liberator is about real-life superheroes. The only thing that separates us from Jeanette or Damon is passion. Their integrity and drive is totally attainable. I have very strong convictions that I don’t do anything about because I let life get in the way. Liberator shows us that we should stand for our convictions and we can become an agent of change.